In order to maximize the production of June-bearing strawberry plants grown in the traditional matted row system, a process called “strawberry renovation” should be undertaken after the strawberries have been harvested. By beginning strawberry renovation immediately after harvest is complete, multiple strawberry pests are more effectively controlled, other pathogens like leaf spot are contained or eliminated, and more strawberry runners will be formed and established causing the harvest for the next season to be larger. The entire process of renovating strawberries should be completed by late July in most areas. It should be noted that most commercial strawberry producers have moved away from traditional matted row production, now use plasticulture, and grow strawberries as annuals instead of perennials. So, this guide to renovating strawberry plants will most likely be of benefit to home gardeners or small-scale strawberry growers. Additionally, the traditional methods used during the renovation of strawberry plants are not organic. The first step in traditional strawberry renovation is chemical weed control. Broad leaf weeds are killed with Amine 4 or Formula 40 (both are brand names of the 2,4-D amine formulation). When using the herbicide, be very careful to precisely apply the chemical as it will cause damage to your strawberry plants as well. Grasses (most annual and perennial grasses) can be controlled with sethoxydin. However, don’t mix the two herbicides in the same container. Spraying for weeds should commence immediately after the final strawberry harvest. After applying herbicide to kill off the weeds, wait four or five days. Then, remove all the old leaves from the strawberry plants by mowing them off. They should be cut right above the crowns, but take special care to not cut too low and damage the crowns. For more guidance on this, see this link: Mowing Strawberries. The main goal of fertilization after mowing is to provide the strawberries with nitrogen to help re-grow a vegetative canopy. Between 25 and 60 pounds per acre should be applied, depending on the soil quality and vigor of the planting. Splitting the application into to two smaller doses of fertilizer separated by about a month will increase the effectiveness of fertilizing. Once the strawberry plants have re-grown their leaflets, sampling them for testing can help direct fertilization more effectively by showing how well the plants are taking up nutrients from the soil. Subsoiling is the process of breaking up compacted soil beneath the topsoil and above the bedrock. After a season of growing strawberries, the harvesting process often yields highly compacted soil between the rows of strawberry plants. It is not vital to perform the tilling or breaking up of compacted soil layers at this point in the renovation process, but it is often a good fit after fertilization. Subsoiling allows for better water infiltration into the soil and, consequently, healthier and more vigorous plants. Each row of planted strawberries should be cut back to between 12 and 18 inches. Strawberries are produced more heavily along the edges of a row. By cutting back the rows, more strawberries are produced. Air flow is also increased through the center of the rows. Sunlight and spray coverage is also better with narrower rows. A rototiller or cultivator should be used to cut back the rows, and the straw or mulch material should be cultivated into the soil simultaneously, if possible. Throwing a half-inch of soil over the rows and runners at this time will help stimulate new root formation as well. It is common practice for preventative weed control steps to be taken following the renovation of strawberry plants. Many commercial operations will use 1/2 the annual rate of terbacil (Sinbar) at this time (4 oz per acre). Since this treatment can harm the strawberry plants, it is essential that they be mowed. For weak plantings, DCPA (8 to 12 pounds of Dacthal per acre) is preferred. If Sinbar is used, four to six weeks later an application of Devrinol (four pounds per acre) is called for in order to suppress winter weeds. During the summer months, the growth of strawberry runner plants will suppress weed growth at the edges of the rows, but shallow cultivation can destroy weeds in other places. Take care not to cultivate deeply in order to avoid strawberry root damage. Appropriate irrigation is necessary for both herbicide activation and growing strawberry plants. If the plants do not receive adequate water, they will become stressed. Ensure that the strawberries receive between 1 and 1.5 inches of water per week, either through rainfall or irrigation techniques. The plant stand within the rows must be sufficient to produce well during the productive season following winter. Contain the plants within the rows and have them establish themselves as quickly as possible. Any strawberry runner plant that is not rooted by the end of September should be cultivated into the soil or otherwise removed. If the plant has not established itself by October, it probably won’t produce any strawberries the following spring. Such a plant is nothing more than a weed itself and should be removed, if possible, prior to winter. The buds (perennating flowers) that will turn into strawberry flowers and eventually strawberries the next spring are formed during August and September. Thus, it is imperative to provide strawberry plants with optimal conditions during these months. An additional 20 to 30 pounds of nitrogen can be added per acre of plants. And, even more importantly, adequate watering is required. 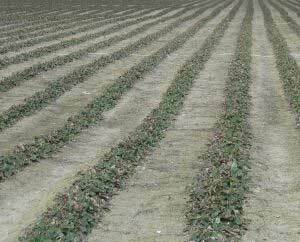 June-bearing matted row strawberry production is no longer en vogue among most larger commercial strawberry producers. Due to the specialized equipment that is required for plasticulture, however, a lot of smaller farms still perform strawberry renovation each year. The question does arise, though, if there is a better alternative. Traditionally, renovating strawberries causes a significant number of chemicals to be introduced into the strawberry field. An, in light of recent studies that show organic strawberry plants are better, strawberry renovation may become less and less useful. I live in zone 6B (Southwest corner of VA) and a year and a half ago (Fall of ’15) I started a Strawberry patch (Approx 7′ x 20′) in my garden. I started with 6 plants ea of 5 different varieties Whopper, All Stars, Honeyes, Surecrops, & Earliglows so ea variety had an area of about 7′ x 4′. Last year, I got some berries out of the patch, but yields were pretty low which I kind of expected however did they ever send the runners last year. This year the patch is much thicker but I feel like I really need to renovate. The production is starting to drop drastically and the plants are starting to send runners. I see in renovation you say to cut them back as soon as possible; if I raise my push mower up as high as possible should I be safe to just bag the clippings and throw in compost? Once I mow them back I will fertilize as stated. If I want to thin the patch, 1)How can I easily tell which plants are the oldest? 2) Should I start thinning out the patch? If so how many plants per sq ft is ideal? 3) Can I thin when renovating or should I wait until the Fall? 3) If I can thin while renovating can I give the plants away to friends and family to plant now or will the summer sun burn them up? Yes, you should be able to mow over top of the strawberries, and the clippings should do well in a compost bin. It can be difficult to tell which plants are the oldest, but typically the older plants will have a thicker crown than younger ones. If your plants are too tightly packed, yes, go ahead and thin them. 3-4 plants per square foot is the max you want to leave. It is more optimal to transplant in the fall, but plants can survive transplantation in the summer as well. By all means, share the wealth with family and friends! And, good luck! Hello! Thanks for all of the great information on this site! I am planting strawberries for the first time this year. Should I still renovate the plants in July if this is my first year? Or should I let them go and establish the runners? Sorry if this has already been answered! I couldn’t find it anywhere! If you are allowing the runners to root, you can still renovate after they are established. Good luck! I planted strawberries in a tropical climate, where there’s no winter or autumn. Do i need to renovate the plants too? If so, do i need to do it the normal way? And, do tropical climates disturb the plants to grow the latent buds for next year? My strawberries are everbearing. The plants will probably still produce at least some buds, and you do need to keep the plants soil nourishing for the plants, but the major difficulty you are likely to encounter is disease infecting your plants eventually due to the heat and humidity. Good luck! Due to scheduling issues, I failed to mow my strawberries after harvest completed in early July. Now, mid august, is it too late to mow? You can go ahead and mow. Good luck! I am on year 3 of june-bearers and got a large decent crop from my home garden. Last year I let them run wild (not knowing how to care for strawberries) and did nothing to care for them over the winter (I live in CO so cold and snow occurs), so have been pleasantly surprised how well they did this year. My question is, should I cut them back this year? Should I let some runners establish? Any help would be appreciated, or links to other parts of your page that may be beneficial. Thanks! Reviewing this information should answer your questions. Good luck! Do you have any info/techniques on strawberry plants that are in hanging baskets? Is it mandatory they be planted in rows in the ground? I like the idea of the berries not touching the ground. For hanging baskets, the primary concern is extra protection during the winter. See here, and good luck! For everyone reading this I would like you to understand that you do not have to use these methods of weed and bug control. Their are many ways to avoid this with a simple mix of water, crushed garlic and cayenne pepper; boil for a few minutes, then spray on plants. Also for those on your first year of planting strawberries I suggest not allowing runners and blooms on the plant; this allows the plant to establish its root system better for next years harvest. Just some tips that can help your gardening experience better! I have planted strawberries in a greenhouse. the first yield was okay and is complete. Do i need to renovate like we do for the outdoor? If they are June-bearing strawberries, you should still renovate them. Good luck! Do you know which variety of strawberry you have? If it is an everbearing variety, they will produce two main crops a year. June-bearing strawberries should only produce one major crop, but they can still produce a small smattering of berries throughout the year. It sounds like you have done what you need to in order to keep your strawberries healthy and happy, so I would not worry about the extra berries. They should produce well again next year for you! Good luck! I have everbearing strawberries that produced a bountiful spring crop. I don’t know the specific type of plant as they were from a farmers patch that needed thinning last year. I used the hill system for planting. Should renovation be done on these types of plants? If so, then when should it be done? Should I cut off any browning stems and leaves throughout the summer? Yes, cut off any dying or dead vegetative matter. If they are truly everbearing, you’ll get a decent second crop toward the end of the season, so you might want to wait for it. Renovation is typically performed on June-bearing varieties. Good luck! I have had a bumper crop of strawberries after renovating them. Now I have noticed runners starting. I do not want more plants so can I cut the runners and depended on the existing crop to produce? Yes, you can cut the runners if you don’t want more plants. After a year or two, however, you need to allow some runners to root to replace the old plants. They typically decrease in productivity after 3 years or so. You can learn more about how to do it here: Transplanting Strawberries. Good luck! Yes, you can indeed use the same ground year after year! 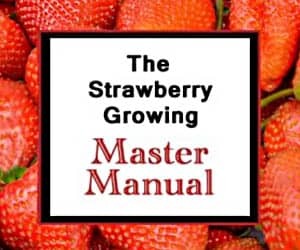 Follow the guidelines on the Growing Strawberries reference page, and, for best results, use this transplanting system. Good luck! I have a 3 year old ozark beauty strawberry patch. It is in a 20 inch wide, 22 foot long strip of dirt between my brick house and a sidewalk on the South-facing side of the house. After a large harvest in June, I let the runners go hoping to cultivate in the new plants and thin out some of the mother plants. Now I have a soid mat of strawberry plants with runners everywhere. It is the end of August, and our first frost averages the middle of October and our last frost in Late May. What steps should I take to prep my patch for next year? And, is there any way to have another harvest this year? Ozark Beauty strawberry plants are everbearing, so you very well might get another harvest before the weather cools too much and dormancy sets in. As for care, review the information on this page, the Growing Strawberries reference page, and the Transplanting Strawberries page. That should get you on the right path! Good luck! Can anyone help? At the end of last year’s harvest I grew new plants from the runners and they have stayed green and ok, the parent plants I left in the pots and they have gone brown and look like they have died. My question to anyone who can help please is, will the old (brown) plants grow again this year? It sounds like your plants have died. If so, they won’t grow back. Your plants might have dried out to the point of death, or the plants might have contracted a fungus or other pathogen/parasite that weakened and then killed them. It is also possible (thought not as likely) that the old plants just lost their vitality after producing for many years and then died of old age. I would recommend separating the old dead plants from the living ones in order to mitigate the possibility of the contamination of the living ones with whatever claimed the older ones. Good luck! My strawberry plants are doing badly. They used to flourish for the first 3 years, but now are thinning out and getting scraggly. It is mid-September, I read about renovation – to be done around June after harvest. Can these plants be dug up and dried out through the winter, and replanted in the spring? When I bought them they were just dried out looking bare clean roots. It sounds like your plants are either losing their vitality (happens between years 3 and 5, usually) or succumbing to some other problem (could be a pathogen or pest also). Unfortunately, however, you cannot dig them up and store them dry over winter. They will certainly die. Although they looked dry when they arrived, they were shipped moist. And, the instructions that usually accompany the bare-root plants indicate that rapid planting is critical. While it is usually best to store them in the ground, if you need to dig them up, you can learn here about Storing Bare-Root Strawberry Plants.